It's up to a week that Samsung launched Galaxy S8 and the Galaxy S8 Plus alongside their very own assistant called Bixby. Samsung's Bixby is the new kid on the block of personal digital assistants and is likely to face a rough reception in a neighborhood dominated by tech sector rivals. 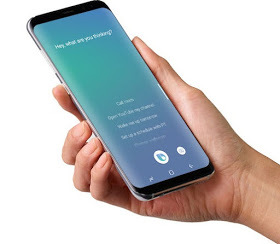 Bixby is an AI system that's designed to make device interaction easier, specifically designed to avoid the complexity of increasingly fully-featured devices. Exclusively made available to Samsung Galaxy S8 devices, but is designed to work across a range of Samsung products. Bixby works like Apple's Siri, Amazon's Alexa, Google's Assistant and Microsoft's Cortana. Bixby understand your natural language, all you need to do is give complete information and Bixby will interpret it and take action. Since it’s made available to only Galaxy S8 & the Galaxy S8 Plus, an XDA member has been able to make it work on older Samsung devices that run Android Nougat. Reboot your device and swipe left from your home screen to harness the full functionality of Bixby. That's all. Do share with your friends. I give I a few updates, it will be installable on other Android devices. But trust tecno and infinix to do their own soon. Copy cats.